Press photo of Living Legends courtesy of Ogden Symphony Ballet Association. Living Legends, a company that tours widely and is based out of Brigham Young University’s dance department, performed their current program, Seasons, for a one-night engagement presented by the Ogden Symphony Ballet Association. The show consisted of a series of Latin American, North American, and Polynesian ensemble song and dance pieces by performers of native descent. Per the show’s title, the pieces were grouped into seasons, each transition accompanied by narrative voiceover and projection. These were not the four solar seasons, however, but social phases which the program notes suggested to be universal to all nations: Promise, Plenty, Prosperity, War, and Rebirth. The title and structure nodded to changes that may be iterative and continuous, but also cyclical, underscoring the company’s dedication to representing tradition but also expressing vital, ongoing contemporary cultural identities. The show began and ended with an element of theatricality. A young person shrouded in low-flow fog was beset by overbearing technologies and swelling electronic beats; they crouched before projections of familiar social media icons and drew their hoodie over their head. A dancer costumed as the eagle, of native North American origins, entered with and maintained a drifting triplet step reminiscent of flight, acting in the role of guide. Small groups in traditional costumes representing each of the three broad cultural sections filtered onstage and formed static tableaus recalling historical dioramas. They sequentially animated, guided by the narrative roles and song, and began to move, seemingly foreshadowing the series to come. Until the final piece, there was no further pageantry external to the dances, and I did not miss it; the execution and energy was more than enough to captivate an audience. The first piece, a festive Bolivian Tinku, was among my favorites. 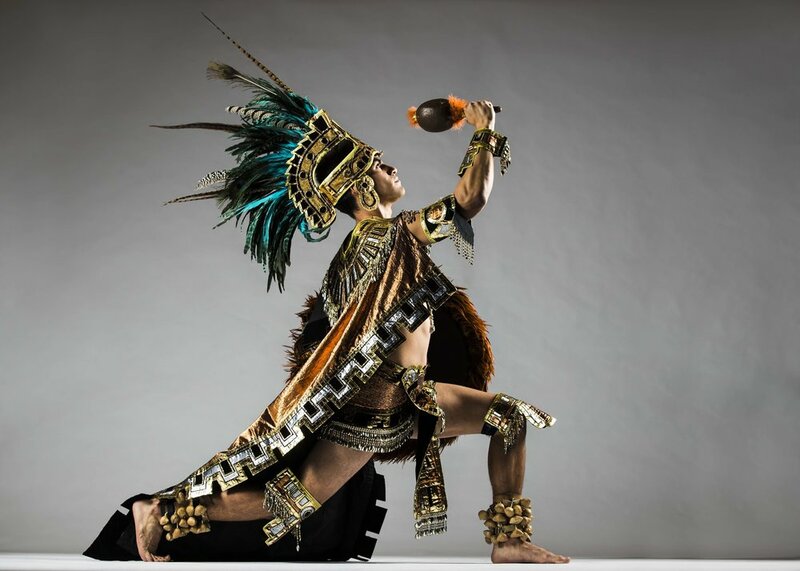 It was danced to a musical recording of heavy drums and panpipes and featured steady marching and tight circling, the performers pitched forward in a half crouch while rhythmically throwing clenched fists, which alluded to the dance’s combat origins. Another stand-out occurred later, in the “Season of Plenty.” This Samoan series featured live percussion, a welcome addition, and the playfully cocky interaction of a charismatic leader, or fa’aluma. After hyping up and drawing out the crowd, he was joined by other men for more sauntering and posturing, and then by a group of women, to form the large ensemble that he directed with shouted cues in performing the seated Sasa. A vernacular of iconic and everyday gestures became a unison sequence of impressive speed and infectious energy. The men resumed their satirical braggadocio to perform the Fa’ataupati, known also as the Samoan slap dance. The whole ensemble performed in startling unison, with the addition of coconut stalks in the Lapa Lapa, which were struck fast and loud against bodies and the floor to great effect. Many of the dances similarly incorporated skilled manipulation of traditional material or costume elements with visual or musical impact, including feather and hand fans, the bells of the jingle dress, the expressively wide skirts of the Mexican folklorico dances, staves and bows in the “Season of War,” spinning poi of Maori origin, and the many hoops of the Hoop Dance. The Hoop Dance closed the series of discrete cultural heritage dances and left a dramatic and lasting impression. Two dancers each artfully arranged twenty or more hoops on and around their bodies, both taking a unique and measured approach to achieving imagery in motion and striking static poses. The Hoop Dance was both showy and personally expressive. A solo dance with many hoops originated in the 1930s and was performed in films and on the traveling show circuit, and was popularized by another touring show: the Lamanite Generation, formed at BYU in 1971 as a Native American performing group, and which became Living Legends. Also dating from that time was the closing song, “Go, My Son,” which espoused the values of family and education. As the closing bookend to the overwhelmed, hoodie-wearing youth’s arc, this number was a reminder that identity is always complex and never monolithic. Faith in, as well as the institutional support of, the Church of Jesus Christ of Latter-day Saints is an intrinsic part of Living Legends’ legacy and continuity, and although this was the least explicitly noted cultural heritage in the show, especially in terms of touring outside the cultural context of Utah, it is an inherently valid aspect of the group’s experience. The show ended in earnest with a simple group song, bow, and ovation, following which the cast of performers headed out into the lobby alongside the audience. After giving such a committed, animated, and technical performance, the company was incredibly generous with their time and energy, engaging with patrons, especially the many kids in attendance, and offering a closer look at their incredible costumes. This level of ambassadorship from the cast in its entirety once again emphasized the company’s commitment to sharing and taking pride in tradition, and doing so as visible, present, and individual, but also interconnected, representatives of living and evolving cultural identities.